Dry rot (Serpula Lacrymans) can occur when timbers come into prolonged contact with a damp environment and insufficient ventilation, this particularly affects sub floor voids. In order to effectively treat this outbreak the affected timbers needed to be cut out and removed from site. 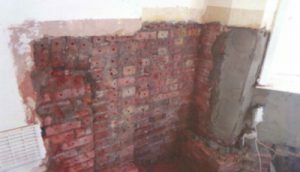 The masonry in contact was then irrigated using a fungicidal preservative which is injected into the brickwork. Further to this, the surface of the masonry is sprayed using a fungicidal biocide. In this instance, a large section of flooring timbers needed to be removed and destroyed. 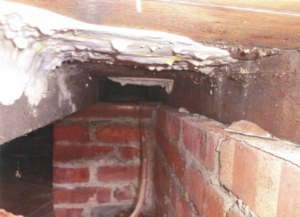 These timbers have been replaced using pre-treated timbers which have been isolated from the masonry as another level of protection against a re-occurrence.